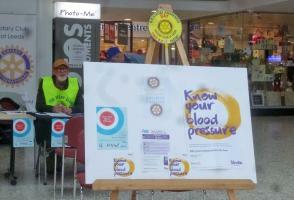 Stroke Awareness – we hold an annual Blood Pressure Testing Day in the Merrion Centre when members of the public can drop by to have their blood pressure checked by qualified health professionals. We support the St. Vincent Centre by donating goods to their Foodbank. We collect and donate harvest goods to Leeds Children’s Charity and Lineham Farm. We provide scented bulbs for the blind and partially sighted at Fairfax House and the Jewish blind group in Leeds, and provide volunteer speakers for Fairfax House. We provide packs of colouring books, crayons, etc. for the children’s heart surgery ward in the Clarendon Wing, LGI. We collect toys and donate them to the Radio Aire Cash for Kids Christmas appeal. We organise chocolate and Easter egg collections for Eckersley House. We provide car parking marshals for the Dragon Boat Races held in Roundhay Park in aid of Martin House.